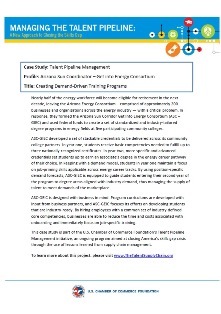 Since 2014 more than 1,000 employers have been using Talent Pipeline ManagementTM (TPM) across 26 states to narrow the skills gap by developing critical partnerships with educators, shortening the time from classroom to career, and increasing the number of skilled applicants entering the workforce. The demands of today’s economy require a strategic alignment between classroom and career that better supports students in their transition to the workforce. 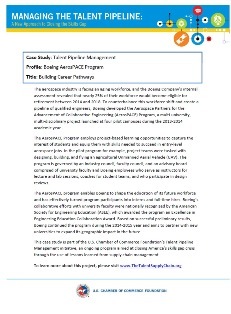 Since the beginning of the TPM movement, we have heard from employers, state leaders, and workforce partners that partnerships are being developed and talent pipelines are being filled with skilled candidates for in-demand jobs. 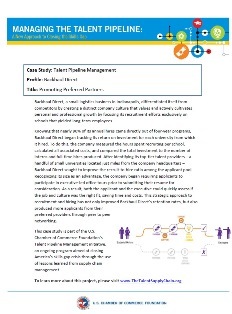 Each TPM case study will continue to evolve as collaboratives develop their strategies, tweak their approach, and forge new partnerships. As we learn more about the successes that those who have adopted the TPM approach have seen, we will try and keep this page updated with those stories. Like several states, Illinois faces a critical shortage of skilled manufacturing workers because many job candidates lack the necessary competencies and industry-recognized credentials desired by employers. 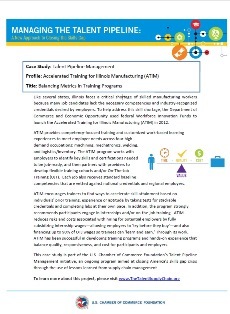 To help address this skill shortage, the Department of Commerce and Economic Opportunity used federal Workforce Innovation Funds to launch the Accelerated Training for Illinois Manufacturing (ATIM) in 2012. 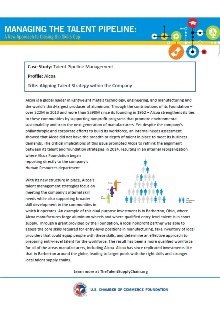 Despite Alcoa's philanthropic and corporate efforts to build its workforce, an internal needs assessment showed that the company did not have the breadth or depth of talent in place to meet its business demands. The critical implications of this issue prompted Alcoa to rethink the alignment between its talent and foundation strategies in 2014, resulting in an internal reorganization where Alcoa Foundation began reporting directly to the company’s Human Resources department. Nearly half of the energy workforce will become eligible for retirement in the next decade, leaving the Arizona Energy Consortium – comprised of approximately 200 businesses and organizations across the energy industry—with a critical problem. In response, they formed the Arizona Sun Corridor Get Into Energy Consortium (ASC – GIEC) and used federal funds to create a set of standardized and industry-tailored degree programs in energy fields at five participating community colleges. Backhaul Direct, a small logistics business in Indianapolis, differentiated itself from competitors by creating a distinct company culture that values and actively cultivates personal and professional growth by focusing its recruitment efforts exclusively on schools that yielded long-term employees. Knowing that nearly 90% of its annual hires came directly out of four-year programs, Backhaul Direct began tracking its return on investment for each university from which it hired. The aerospace industry is facing an aging workforce, and the Boeing Company’s internal assessment revealed that nearly 25% of their workforce would become eligible for retirement between 2014 and 2018. To counterbalance this workforce shift and create a pipeline of qualified engineers, Boeing developed the Aerospace Partners for the Advancement of Collaborative Engineering (AerosPACE) Program, a multi-university, multi-disciplinary project launched at four pilot campuses during the 2013-2014 academic year. 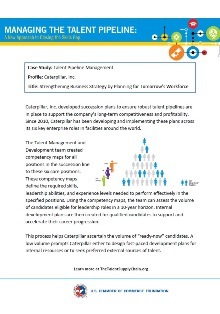 Caterpillar, Inc. developed succession plans to ensure robust talent pipelines are in place to support the company’s long-term competitiveness and profitability. Since 2010, Caterpillar has been developing and implementing these plans across its six key enterprise roles in facilities around the world. 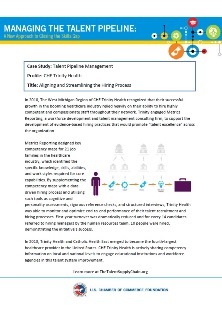 In 2010, The West Michigan Region of CHE Trinity Health recognized that their successful growth in the booming healthcare industry relied heavily on their ability to hire highly competent and compassionate staff throughout their network. 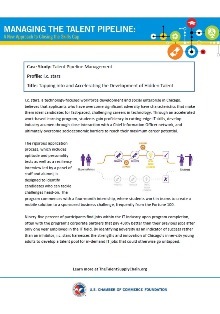 Trinity engaged Metrics Reporting, a workforce development and talent management consulting firm, to support the development of evidence-based hiring practices that would promote “talent excellence” across the organization. In 2013, Southern New Hampshire University (SNHU), a private, accredited, nonprofit university and the largest nonprofit provider of online education in New England, recognized an untapped talent pool already existing in the workforce—employees with strong leadership potential but nontraditional education backgrounds. Employers openly recognized the contributions these individuals made to their businesses but identified barriers to their career advancement owing to limited credentials and proficiency in critical skills. From startups to large corporations, companies of all sizes are struggling to keep up with the rate of change in digital technology, creating in-house digital skills gaps. 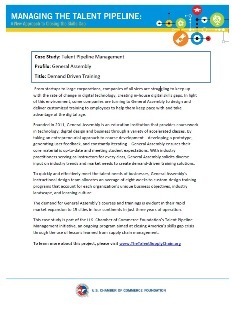 In light of this environment, some companies are turning to General Assembly to design and deliver customized training to employees to help them keep pace with and take advantage of the digital age. i.c. stars, a technology-focused workforce development and social enterprise in Chicago, believes that applicants who have overcome significant adversity have characteristics that make them ideal candidates for fast-paced, challenging careers in technology. Through an accelerated work-based learning program, students gain proficiency in cutting-edge IT skills, develop industry acumen through close interaction with a Chief Information Officer network, and ultimately overcome socioeconomic barriers to reach their maximum career potential. 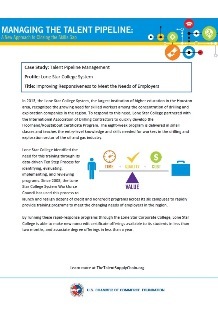 In 2013, the Lone Star College System, the largest institution of higher education in the Houston area, recognized the growing need for skilled workers among the concentration of drilling and exploration companies in the region. To respond to this need, Lone Star College partnered with the International Association of Drilling Contractors to quickly develop the Floorhand/Roustabout Certificate Program. 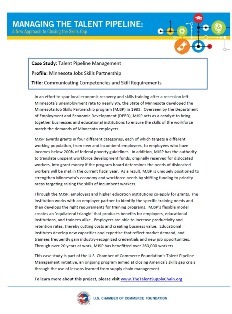 In an effort to spur local economic recovery and skills training after a recession left Minnesota’s unemployment rate to nearly 9%, the State of Minnesota developed the Minnesota Job Skills Partnership program (MJSP) in 1983. Overseen by the Department of Employment and Economic Development (DEED), MJSP acts as a catalyst to bring together businesses and educational institutions to ensure the skills of the workforce match the demands of Minnesota employers. 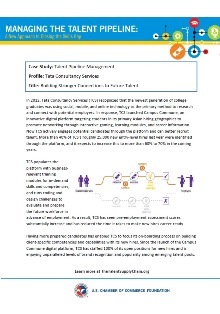 In 2012, Tata Consultancy Services (TCS) recognized that the newest generation of college graduates was using social, mobile, and online technology as the primary method to research and connect with potential employers. In response, TCS launched Campus Commune, an innovative digital platform targeting students in its primary Asian hiring geographies to promote networking through interactive gaming, learning modules, and career information. Toyota’s first wholly owned U.S. manufacturing facility in Georgetown, Kentucky, had been relying on hiring local talent and internal promotions to keep the facility running smoothly since the 1980s. But after industry perceptions shifted, manufacturing talent pools began to shrink. In response, Toyota partnered with Bluegrass Community and Technical College (BCTC) in 2010 and developed the Advanced Manufacturing Technician (AMT) program. With the rapid advancements in technology showing no signs of slowing down, companies must always be one step ahead of their competitors in delivering new products that incorporate these technological advances. 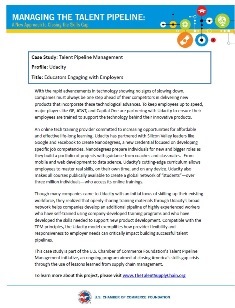 To keep employees up to speed, major players like GE, AT&T, and Capital One are partnering with Udacity to ensure their employees are trained to support the technology behind their innovative products. 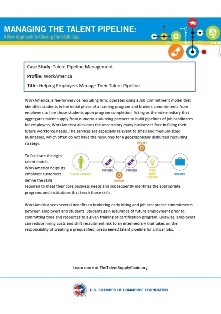 WorkAmerica, a fee-for-service recruiting firm, operates using a Job Commitment model that identifies students in the initial phase of a training program and brokers commitments from employers to hire those students upon program completion. 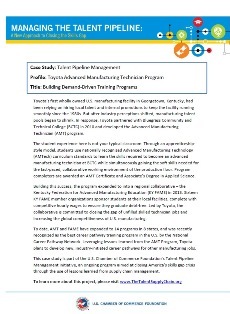 Acting as the intermediary that aggregates talent supply from numerous sourcing partners to build pipelines of job candidates for employers, WorkAmerica alleviates the uncertainty many businesses face in filling their future workforce needs.